The second Grand Slam of the 2016 Calendar Year, the ATP French Open, is set to take place in Paris between May 22 and June 5. The showpiece event of the clay court season is a three horse race in the betting market as Roger Federer pulled out earlier last week. Find here our 2016 French Open men's tournament betting preview with tips, predictions, best odds, free bets and bookie promotions! Novak Djokovic has been at the top his game for five years now and has 11 Grand Slam titles to his name. However, the French Open remains the only slam Djokovic has yet to win - he finished as the runner-up the last two years in Paris. The Serb heads into Roland Garros coming off a finals loss, 6-3, 6-3 to Andy Murray in the recently-concluded Italian Open but boasts an impressive 35-3 record in 2016, including his 11th career Grand Slam win in the 2016 Australian Open. Andy Murray has been the most improved player on clay in the last 12 months and he enters this tournament on the back of a strong win over Djokovic in the final of the BNL Internazionali d'Italia in Rome. Furthermore, Murray delivered an impressive semi-final triumph over Nadal in Madrid few weeks ago. The Brit has also reached the semifinals in the previous two years at Roland Garros and has a record of 20-5 this season. Rafa Nadal has recaptured glimpses of his best form this European clay court season after a very disappointing Latin America campaign, where he was defeated in the semi-finals of Buenos Aires and Rio de Janiero. The Spaniard has won the French Open nine times already and is 19-4 on the clay surface this season. Nadal has been handed a tough draw in Paris, not only does he have a potential meeting with Djokovic in the semi-finals but he also could face solid clay-courter Jo-Wilfried Tsonga in the quarter-final as well as rising star Dominic Thiem, who beat Roger Federer in Rome. Djokovic has won his last seven matches against Nadal, including the last 10 sets. The bookies don’t give Stan Wawrinka, last year’s champion, much hope as his form hasn’t been overly impressive in the lead-up to Roland Garros. The Swiss has not made the semifinal round in all of his last five tournaments since winning two titles in January and February 2016. The Swiss is more than capable of beating anyone on his day, but given the consistency of rivals Djokovic and Murray we cannot see him retaining his title. Kei Nishikori is playing his best tennis of the season and reached consecutive Masters 1000 semi-finals in Madrid and Rome, narrowly falling to Djokovic on both occasions. Jo-Wilfried Tsonga will be hoping to give the French crowds the winner they desire. The Frenchman has made a couple of semi-finals and a couple of quarter finals this season but a victory here is beyond his potential. The rising star Dominic Thiem has won two titles this year already. He has wins over Roger Federer, Rafael Nadal and David Ferrer this season too so he can beat the big players. The Austrian has been handed a tough draw - his quarter contains Rafa Nadal, Jo-WIlfried Tsonga and David Goffin - but he can be the surprise of this year's tournament. Price boost: 12/1 Andy Murray to win the French Open (was 4/1) + £10 free! 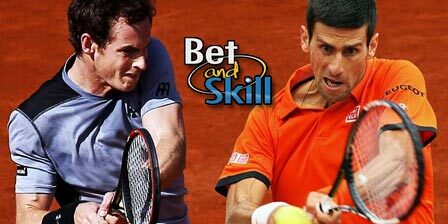 "2016 French Open Men's Outright Winner predictions, betting tips, odds and free bets"